A Lot of changes will and could happen at the Northern end of Merseyrail‘s Northern Line in the next few years. New bespoke Stadler trains will be introduced, that will run services from Liverpool to Kirkby, Ormskirk and Southport stations. Class 319 and Class 319 Flex trains will start to appear at stations like Kirkby, Ormskirk and Southport, where Merseyrail’s network joins Northern Rail’s lines from Bolton, Manchester, Preston and Wigan. A new station at Maghull North will be built. Skelmersdale, which is one of the largest towns in the North-West without a rail connection, could be linked to Merseyrail’s network. A new Headbolt Lane station could be built to create a proper connection between Merseyrail and Northern’s trains using the Kirkby Branch Line to Wigan Wallgate station and onwards to Bolton, Manchester and Manchester Airport. Ormskirk station could be remodelled to allow direct services Liverpool and Preston. The Canada Dock Branch could be electrified and be opened to passenger trains. 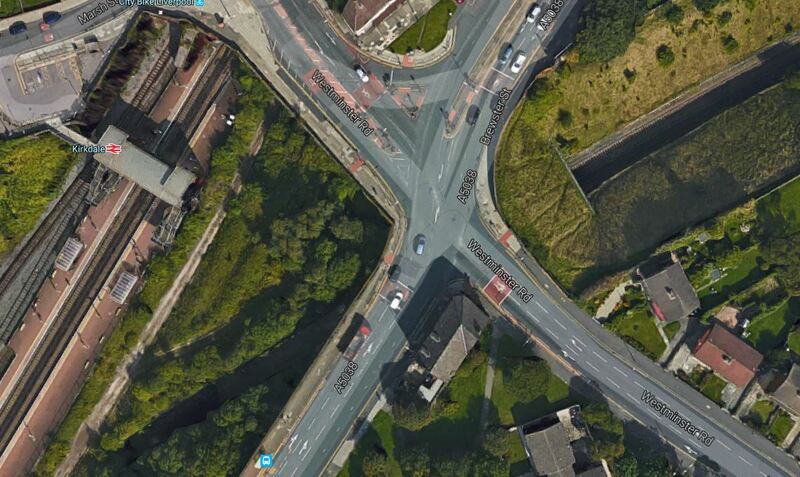 The Burscough Curves could be reinstated. The Southport to Manchester Line could be electrified. Everton could be building a new stadium at Bradley Moore Dock. In the next series of sections, I will cover some of these changes and issues raised in more detail. Where I live in Dalston in East London, the London Overground run services at what they call a Turn-Up-And-Go service of four trains per hour (tph). Merseyrail use this frequency on some of their lines, as do Birmingham and Leeds. I wouldn’t be surprised to see this on some more routes in the North-West, where there is sufficient demand. Can Stadler’s New Trains And Class 319 Trains Share The Same Tracks and Platforms? I’m not sure about this, as until we see the new trains and/or their specification making a comparison is difficult. Both trains can run on third rail electrified lines, although most of the current Class 319 trains working in the North West have had their third rail equipment removed. The Stadler trains must be designed to work with the current Class 507 and Class 508 trains, which they probably must do during the introduction phase. So could there be size problems between Stadler’s and the Class 319 trains? But seeing how Stadler are always a company for the main chance, I wouldn’t put it past their engineers to design a train, that can work the same routes as all variants of the Class 319 trains, as replacing them in a few years time would be a nice little earner. There is also plenty of words in the media, which state that 25 KVAC overhead capability can be added to the Stadler trains, so they can work lines out of Liverpool Lime Street. As an aside here, I should mention the Halton Curve, which is to be upgraded to create a new route between Liverpool and Chester. Under Upgrade in the Wikipedia entry for the Halton Curve, this is said about the building of the curve and its future services. The Liverpool City Region Combined Authority approved the work in April 2016, utilising Government’s Local Growth Fund (LGF) funding £10.4 million, adding an additional £5.67 million from the city’s LGF. Work is hoped to start in June 2017 and to be completed in May 2018. This should lead to an hourly service between Liverpool and Chester from December 2018 along the curve with some services extending into North Wales. With their dual voltage and electro-diesel capability, the Class 319 Flex trains must be an ideal train to work services to Chester and North Wales via the Halton Curve. So I suspect there could be a lot of compatibility between the current Merseyrail trains, the new Stadler trains and the Class 319 trains, as otherwise it could be tricky to work the Halton Curve to Chester, until the new Stadler trains are delivered. This leads me to say that there should be no problems with both sets of trains sharing platforms and tracks on the surface branches of the Northern Line to Kirkby, Ormskirk and Southport. I suspect that the Class 319 trains could also work the Northern Line tunnels, but I suspect that would be a step too far for Merseyraiil and they would prefer their network to be reserved for their new Stadler trains as much as possible. The Canada Dock Branch will have a large influence on what happens to the rail services in the North of Liverpool. There will be a massive increase in capacity of Liverpool Docks after the completion of Liverpool2. Under Freight Use in the Wikipedia entry for the Canada Dock Branch, this is said. Due to the construction of Liverpool2 container terminal at the port of Liverpool the line will increase in freight traffic. In May 2016 it was announced that the line’s final section into the dock estate would be upgraded to double track from single track to increase capacity to the port. Combined with improved signalling at Earlestown, the improvements will enable up to 48 trains a day to enter the port. Work on the line is expected to be completed by 2019. How many trucks is that going to remove from the M62? Under Passenger Use in the Wikipedia entry for the Canada Dock Branch, this is said. The line is also being seriously assessed for reopening to passengers with Everton F.C. and Liverpool F.C. stadia both located on the line’s route. On 16 July 2007 the Liverpool Daily Post reported that Liverpool F.C. may partially fund the reopening of the line to passenger services providing a direct rail link to the proposed Stanley Park Stadium however this project has since been dropped by the club. This was highlighted on the Network Rail North West development plan as a potential project to be undertaken by Network Rail, rather than Liverpool F.C.. The Department for Transport’s Rail electrification document of July 2009, states that the route to Liverpool Docks will be electrified. The Canada Dock Branch Line is the only line into the docks. Add this to 48 freight trains per day running into the Docks and this must surely result in the Canada Dock Branch being electrified between Liverpool Docks and where the Branch joins the electrified Liverpool and Manchester Lines at Wavertree Technology Park station. This is also said about passenger services. The electrification of this branch line would greatly assist in recommissioning passenger trains, as costs would be reduced. The electrification of the Liverpool and Manchester line will reduce travel time from around 45 minutes to 30 minutes between the two cities due to the greater acceleration achieved by electric trains in clearing lines quickly, and the raising of the speed limit along the line from 75 to 90 mph. These advantages will cascade onto the Canada Dock branch line. Class 319 dual-voltage, 3rd rail and overhead wires, EMUs will be fully refurbished and transferred from the Thameslink route to operate between Liverpool, Wigan and Manchester. The dual voltage trains can operate on Merseyrail’s 3rd rail network giving greater scope for route planning. There is also a serious suggestion to introduce passenger services on this line in the Local Transport Plan for Merseyside. This was again mentioned in Merseytravel’s 30-year plan of 2014. Putting the comments about electrification, passenger services and 319 trains together with Network Rail’s performance as regarding electrification in the North-West, I now feel that Porterbrook, Northern Rail and Rail North have thrown a very large drum of lubricating oil into the mix in the shape of the Class 319 Flex train. A passenger service could be run along the Canada Dock Branch, as soon as the following conditions are met. Some stations have been built or reopened. The route is appropriately signalled, tested and certified. A small number of Class 319 Flex trains are available. This Google Map shows Kirkdale station on the Merseyrail Northern Line. Note the dark cutting going North-East to South-West across the map. With a more detailed resolution, I can see railway tracks in the bottom. This is the Canada Dock Branch. So what do I think will happen and where would I put my money? An interchange at Kirkdale station between the Canada Dock Branch and the Northern Line. It will be interesting to see what happens to the Canada Dock Branch. Headbolt Lane station is Merseyrail’s solution to connecting the single-track Kirkby Branch of the Northern Line to the double-track Kirkby Branch Line from Wigan Wallgate station in an efficient manner. In this section, by Kirkby, I mean Kirkby and/or Headbolt Lane. The former would apply now and the latter, when it is built. Currently, a train running between Kirkby and Salford Crescent stations takes around 60 minutes, via Atherton. If I apply Irene’s Law, which admittedly applies to London Underground journeys, but seems to work in a rough manner on intensive urban and suburban lines, I reckon that an electric train can do the following. So it leads me to think that a Class 319 Flex train, which is faster than the current Class 156 train, could probably do Kirkby to either of the two Manchester stations in under an hour. To provide a two tph service to Manchester would require four trains. To provide a four tph service to Manchester would require eight trains. Where the benefits come, is when all the lines are electrified, which means faster speed and quicker stops. Take the four tph service between Dalston Junction and New Cross. As the service takes 22 minutes, the round trip can be done within an hour, giving drivers time to turn the train and have a comfort break or a coffee. So this shorter route will only need four trains to porovide a four tph timetable. Anything that can be done to reduce the journey time, means the required frequency can be attained with a smaller number of trains. Going back to the Kirkby to Manchester service. There is a bay Kirkby/Southport-facing platform at Wigan Wallgate station, which is shown in this Google Map. And here’s a picture of the platform. According to Wikipedia, the bay platform is for trains for Southport and Kirkby. Wigan to Kirkby is currently scheduled at 24 minutes, which I suspect is so that a Class 142 Pacer can do a complete trip within the hour. So this would mean the following. 2 tph between Kirkby and Manchester would need 4 trains. 2 tph between Kirkby and Wigan Wallgate would need 2 trains. So two trains have been saved. 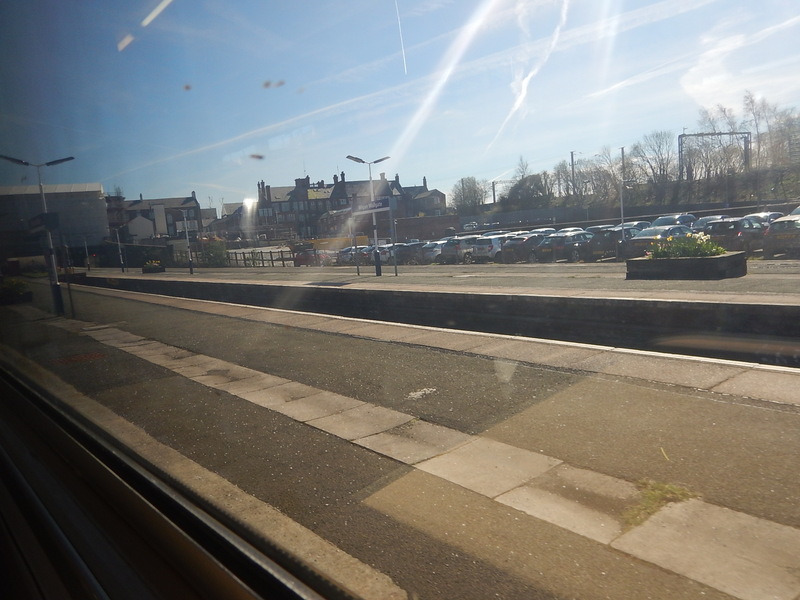 But Kirkby to Wigan Wallgate is run at a Turn-Up-And-Go frequency of 4 tph, where the trains have cross-platform access to Liverpool to Kirkby trains with the same frequency. I wasn’t intending to look at Southport to Manchester now, but as I’ve just looked at Kirkby to Manchester and the two routes both go through Wigan Wallgate station, I’ll do it to follow the Kirkby analysis. Currently, a train running between Southport and Salford Crescent stations takes just over 60 minutes, via Atherton, with Southport and Wigan Wallgate taking thirty minutes. 2 tph between Southport and Manchester would need 4 trains. 2 tph between Southport and Wigan Wallgate would need 2 trains. If the timings were aligned, every inbound Wigan Wallgate service from both Kirkby and Southport would arrive at Wigan Wallgate, in front of a Manchester service, which could take them to where they wanted to go, if it was beyond Wigan. So with 12 trains, the following lines could get these services. From Salfrord Crescent, passengers will after the Ordsall Chord and the related works have been completed, be able to get easily to Deansgate, Hazel Grove, Manchester Airport, Manchester Oxford Road, Manchester Piccadilly, Manchester Victoria, Salford Central, Stockport and probably a few others too. Obviously, there are other and better patterns. But it just shows what can be done, by creating a network of electrified and pseudo electrified lines into Manchester and funnelling them through a series of interchanges. There were some good thngs done by British Rail in the 1960s and 1970s, but there were some supreme examples of crap design. 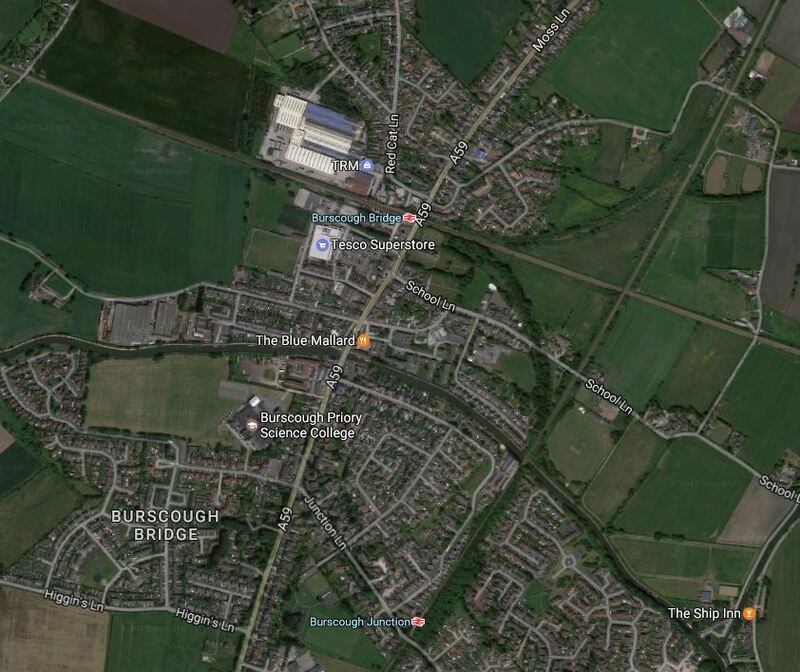 This Google Map shows trhe Burscough Curves, which I suspect were originally designed to make operation of trains to the South East of Southport a lot more efficient. There are two railway lines on the map. Burscough Bridge station is on the Southport to Manchester Line, which is a major commuting route. Burscough Junction station is on the Ormskirk Branch Line, which is an extension of Merseyrail’s Northern Line, that links it to Preston. Connecting them are the North and South Burscough Curves. This description of the Burscough Curves, is a simplified version of that in Wikipedia. During the rail restructuring of the 1960s and 1970s, the “Burscough Curves”, which formed a link between the Ormskirk-Preston and Southport-Wigan lines were removed, although the formation survives. The North Curve was taken out of use and severed in July 1969, being lifted in 1973: it was last used for a Saturdays only empty train from Blackpool to Southport. The South Curve was singled in 1970, but remained in use to serve the extensive sidings at the MOD depot located just to the north of Burscough Junction station. It saw its last train in 1982. Pressure from local transport groups, has not so far persuaded Network Rail to reinstate the curves. Various schemes have been proposed, including the full electrification of the line from Southport via Burscough to Ormskirk using the same third rail system as Merseyrail. This proposal would allow users of the Ormskirk branch of Merseyrail’s Northern Line to reach Southport directly. Wikipedia also says something of how they might be used in the future. A new study being conducted by Merseytravel could see demand for a potential reinstatement and electrification of the curves in the near future. The uses of the curves in a new service pattern has been identified by Network Rail, if electrified along with the through lines. One factor more than any other will decide what happens to the Burscough Curves and the possible opening of a through route from Ormskirk to Preston and that is new housing developments in the area. Midge Hall on the Ormskirk Branch Line could be the next to open. This is mentioned in my extract from Wikipedia’s entry for the Burscough Curves. I suspect that any reinstatement of the Burscough Curves would develop this alternative route from Liverpool to Southport. If you take one of the new Northern Electrics from Liverpool Lime Street to Preston, it’ll take you 58 minutes. If you go the other way by taking a Merseyrail train from Liverpool Central to Ormskirk and then a train for Preston, it will only take you just seven minutes longer. The time could and probably will be reduced in the next few years. When the new faster Stadler trains are running to Ormskirk, it is likely that 6-7 minutes will be taken off the time. Eliminating the change of trainat Ormskirk could reduce the time. But new modern trains could go much faster on an improved Ormskirk Branch. I would estimate that times of forty minutes could be achieved, with perhaps a frequency of two tph. Higher frequencies like 4 tph, would probably need full restoration of the second track between Ormskirk and Preston. This fast time would attract passengers and especially those living in the North of Liverpool and on the coast to Southport. But other factors would also help. Fast trains to the North and Scotland will call at Preston and going via the Ormskirk Branch may be more convenient for many. Aintree station is five stations South of Ormskirk, so the route may offer a quick way to the races. The Open is at Royal Birkdale this year. I have a feeling that extending the Northern Line from Ormskirk to Preston, with a well-thought out treatment of the Burscough Curves, may produce lots of passengers that the train companies didn’t think existed. Everton may well be building a new stadium at Branley Moore Dock, which is between Sandhills station and the City Centre. For a new sports ground, that could be the centrepiece of a Commonwealth Gales in 2022 or 2026, it is well-placed and not far from Merseyrail’s Northern Line. I have discussed this project in Everton’s New Stadium. Except for possibly changes of services at times, it should not affect operation of services on the Northern Line.